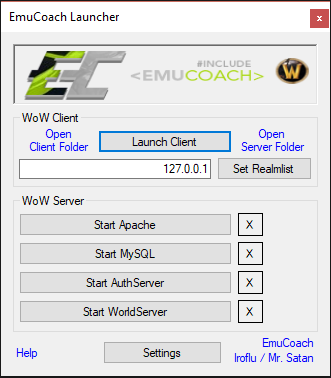 I have developed a launcher for the EmuCoach Repack (which should work with other repacks)! I've grown tired of having to constantly find my server folders and having so many shortcuts for starting the server on my desktop, which lead to the idea of a server starter. 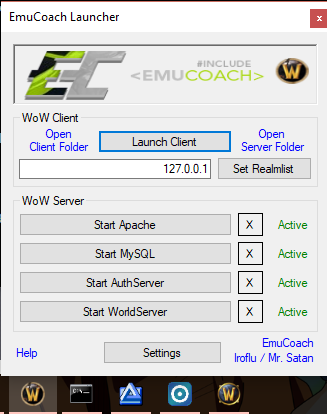 EmuCoach also used to have an official launcher with it, but it's disappeared, so I figured I'd combine the two! You can change the realmlist from the launcher for ease of access for joining other servers. You can also open your WoW client, open the MySQL, Authserver, and Worldserver all in one application. March 3rd Edit: I have re-uploaded the launcher with a new name for the archive, as I had to create a new zip archive. Somehow the old one had an error. The name is different, but the virus link is for the same 2 files within the archive. You can see how to use it in the post below. I will not be requiring you to post before downloading, mainly because I'd rather upload this through EmuCoach itself, and not externally. So as long as you are a registered user, you can download the launcher below! While I wont require you to post, please feel free to share your opinions on it. How can I make it better? Are there any errors or bugs? March 9th - Uploaded v1.3 - Now with Apache support! Last edited by Mr. Satan; 03-11-2018 at 02:44 AM. Upon first opening the main application (first picture in post above), you will want to click the 'Settings' button. The settings window will look like the second picture in the post above. This window is where you will set your client/server/core locations. Click the '...' buttons next to each box to locate the proper folder. Client - Your WoW game client's folder. Server - The folder where MySQL.bat and Apache.bat are. Core - The folder where Authserver.exe and Worldserver.exe are. If you gave the correct folder paths and the application is able to find everything it needs, the color of the text box will change to green. If not, it will remain/change back to red. 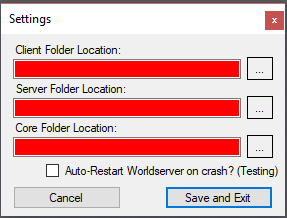 If you would like the server starter to automatically restart Worldserver.exe upon crashing (on a 60 second timer), check "Auto-Restart Worldserver on crash". Notice the "(testing)" next to it, as I'm not sure it fully works yet. However, I have yet to be told it doesn't. Now click "Save and Exit". When you click any of the buttons to start MySQL, Auth or World or Apache, you will notice green text next to it saying "Active". You will not see the MySQL window open, but you will see every other window open. As for launching your client, you can just click "Launch Client". The application comes with a quick easy way to change your realmlist, so all you have to do is type in the IP you want to connect to (127.0.0.1 for local servers), then click "Set Realmlist". That's all there is to know about the Repack Launcher. Please feel free to ask any questions about bugs/issues, or just questions in general about the application. Last edited by Mr. Satan; 03-10-2018 at 03:50 AM. It looks very handy, Is it able to restart a crashed server? What I mean is does it bypass windows error reporting. I never play the game as a GM. Only a player character can test properly. It does not bypass Windows Error Reporting. I messaged this in the forum chat first as I didn't see you posted until afterwards. Basically, if the current "quick add" of the server-restarter doesn't work, then I'll look into bypassing it. Or I'll just do it anyway in the next update, but hopefully it'll work without it. Good job and will apache server be available? Somehow I didn't even see this post until you PMed me about it.. I check the activity feed every day, so I've no idea how I missed it and sorry about the wait. As for Apache, I can look into adding it soon. Currently working on another WoW-related project which is taking a large portion of my productivity and frustration. However, adding Apache should be easy, all you do is open Apache.bat, right? If so, then I'll have it added as soon as I finish my current project. The file has been re-uploaded! I'm not sure if it broke with the server migration or if it's been broke this entire time. Last edited by Mr. Satan; 03-09-2018 at 06:00 AM. I have added Apache support, thanks to the idea of @[Only registered users can see this link. Therefor you need to register first, and hopefully we see you wanting to join our friendly community we are trying to build up. Enjoy! ], and also finally wrote the instructions in the 2nd post. Nice! Thanks for creating this. I am sure this will be very useful for me and others too. Well done!